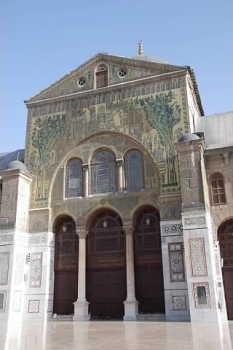 Damascus is often referred to as the oldest continuously inhabited city in the world. Damascus has a wealth of historical sites dating back to many different periods of the city's history. Since the city has been built up with every passing occupation, it has become almost impossible to excavate all the ruins of Damascus that lie up to 8 feet below the modern level. The Citadel of Damascus is located in the northwest corner of the Old City. The street called straight (referred to in the conversion of St. Paul in Acts 9:11), also known as the Via Recta, was one of the main streets of Roman Damascus, and extended for over 1500 meters. Today, it consists of the street of Bab Sharqi and the Souk Medhat Pasha, a covered market. The Bab Sharqi street is filled with small shops and leads to the old Christian quarter of Bab Touma (St. Thomas's Gate). Souq Medhat Pasha is also a main market in Damascus and was named after Medhat Pasha, the Ottoman governor of Damascus who renovated the Souq. At the end of the Bab Sharqi street, one reaches the House of Ananias, an underground chapel that was the cellar of Ananias's house. Just been to the Old City today, looking for genuine Damaschin things to buy for my daughters. Wandered around parts of the Old City without a map, knowing the sun was in South. I was the only foreigner around for obvious reasons, which was kind of nice since everybody said "hello", offered me tea or fresh orange juice (yummie!) and wanted me to see their shop or just have a chat. Towards Bab Sharq, I found a shop with furniture etc. of wood with inlaid Mother of Pearl - really nice things. According to the shop owner, it is hand made, he showed me his workshop, and I will go back and buy some of his things since finishing and design was really nice - and hand made, nor produced by a machine. Furthermore, I saw numerous cafés and restaurants in my way; I cannot wait to try them out, escaping the awfull hotel food! Got to get to know the full story of Dimasq! There is no city in the Middle East that can offer such a beautiful and authentic old town as Damascus. Do not try to follow the map but dare to let yourself drift through the small, narrow and winding streets of the old town and immerse yourself in the bustling life of the Souq and the Muslim, Christian and Jewish Quarter. Entertain yourself with the stores owners who drink tea and chat with locals. The Old City of Damascus is an oriental dream and the people living there are known from a hospitality and likability. I am half syrian, every time i visit family i love seeing the old part of the city and my favorite part is visiting al-humadiya, it's amazing, every one should see the wall!!! I went to Syria in 1997. Syria was a wonderful country to visit. Damascus was the first stop. The Damascus museum has great things to see but isn't up to modern standards. The facade of the entrance is fabulous. The main mosque must be seen for the courtyard and its mosaic facade. The interior is bland and rebuilt after a fire 100 years ago. I walked around the souk and the modern suburbs for hours. Don't miss a visit to the nearby hills to see an overview of the city and see how it is an oasis. Besides being a fascinating place, the people I met were so friendly. I went with my freinds to Omayad Mosque wich is very very big and we saw the tomp of the profit Yahya "St. Jhon the Pabtist" , then I went with my Family to visit Azem Palace , it is now a museum for traditions . we had lunch at a very beutiful restaurant, it was a house and converted to a restaurant , we fill our stomaks with a very delicias food. my father working in the tourism field and he always telling me about the visitors from europe how they are astonished when they enter the Markets and old street.He told me that there is a church in Damascus still underground, many people visited. I wish to visit it one day, I feel very proud that I live in Damascus. I am a London born freelance photographer and have been living in the wonderful city of Damascus for almost two years now. Without doubt Damascus has a wealth of history, be it Christian, Muslim or a host of other faiths and beleifs but for me the real charm of this once great city is the hospitalty of its people. What Damascus lacks in other areas is more than made up with its friendliness. Visit mty web site for a taste of Damascus. Read more from john wreford here. Ottoman Empire: Part of empire from 1517-1864. Visible remains for example in Fethiyye Madrasa, Ahmed Semsi Pasha Complex. Charles Montagu Doughty: The famous opening lines of "Travels in Arabia Deserta" state "A new voice hailed me of an old friend when, first returned from the Peninsula, I paced again in that long street of Damascus that is called straight." Ibn Khaldun: In 1400 was sent there from Cairo by the Mamluk sultan to negotiate with Tamurlane who was besieging the city. Mapped or Illustrated by Blaeu: On top frieze of "Appendix Theatri A.Ortelii Et Atlantis G. Mercatoris"(1631 but map dates to 1617). Mosques converted from churches , cathedrals or synagogues: In 705 the "Church of St John" was rebuilt as a mosque (immediately after the Muslim conquest in 636 it was shared between Christians and Muslims). Now known as "Umayyad Mosque". Relics from John the Baptist: Umayyad Mosque - A shrine is said to contain the "head"
Early Christianity: "House of Ananias" 1st century AD. Believed to be the house where Ananias baptised Saul and later became a Christian church. It "is the only early Christian house of worship from the first century to survive" in Damascus (Wiki). Shia Islam: Sayyidah Ruqayya Mosque - contains the grave of Sukayna (née Ruqayyah), the infant daughter of Husayn ibn 'Ali. An Iranian style Mosque was built (around the historic Mauloseum (which is immediately West of the Omayyad Mosque) in 1985. St Paul was here: Underground remains at the end of the "Street called Straight" are believed to be The House of Ananias of Damascus where he baptised St Paul. Built or owned by French: Bab-Kissan's church: One of Damascus eastern wall's doors. the French built a church there in 1934.